We are very excited to present this season’s Archway Veritas choral production! 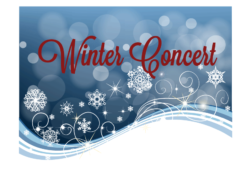 Please remember that Winter Concert attendance for students is Mandatory. Out of recognition for the work students have put in this semester, and the common musical culture they have all built together, students will stay for the duration of their concert. For example, Kindergarten students will stay to listen to the first grade concert, and this will also apply to the second & third grade concert and the fourth & fifth grade concert. Tuesday, December 5, 2017, 5:30 p.m. Please feel free to contact Dr. Tsai (stsai@archwayveritas.org) with any questions or concerns you might have regarding the Kindergarten and 1stgrade concert. Wednesday, December 6, 2017, 5:30 PM. Girls’ hair must be neat and out of the face. Girls may wear black flats. Wednesday, December 6, 2017, 7:00 PM. Boys: White collared button down shirt; tie (without any logos or depicting favorite sport team); black dress pants (no jeans); black or brown belt; dark colored socks; black dress shoes (no sneakers). Girls: White blouse (no t-shirts); black skirts (no minis – all skirts should touch the knees), OR black dress (it can have white but no other color on it); black dress flats. Hair, jewelry and make-up need to be done appropriately. Please feel free to contact Ms. Volodarskaya (avolodarskaya@archwayveritas.org) with any questions or concerns you might have regarding 2nd – 5th grade concerts.